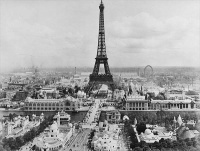 The Exposition Universelle of 1900 was a world's fair held in Paris, France, to celebrate the achievements of the past century and to accelerate development into the next. The style that was universally present in the Exposition was Art Nouveau. More than 50 million people attended the exhibition (a world record at the time), yet it still failed to turn a profit, costing the French government 2,000,000 Francs. The fair included more than 76,000 exhibitors and covered 1.12 square kilometres of Paris. The Exposition Universelle was where talking films and escalators were first publicized, and where Campbell's Soup was awarded a gold medal (an image of which still appears on its label). At the Exposition Rudolf Diesel exhibited his diesel engine, running on peanut oil. Brief films of excerpts from opera and ballet are apparently the first films exhibited publicly with projection of both image and recorded sound. The Exposition also featured many panoramic paintings and extensions of the panorama technique, such as the Cinéorama, Mareorama, and Trans-Siberian Railway Panorama. The exhibition lasted from 14 April until 10 November 1900. A special committee, led by Gustave Eiffel, awarded a gold medal to Lavr Proskuryakov's project for the Yenisei Bridge in Krasnoyarsk. A number of Paris' most noted structures were built for the Exposition, including the Gare de Lyon, the Gare d'Orsay (now the Musée d'Orsay), the Pont Alexandre III, the Grand Palais, La Ruche, and the Petit Palais. The first line of the Paris Metro also began operation to co-incide with the Exposition. Although completed in just 18 months, it was nevertheless slightly late, taking its first paying passengers to the Ancien Palais du Trocadéro site on 19 July 1900. Part of the Exposition was the Second Olympic Games, which were spread over five months. The games also marked the first participation by female athletes and, in such sports as tennis, football (soccer), polo, rowing and tug of war, teams were multinational. A Human Zoo was present at the exposition. The Finnish Pavilion at the Exposition was designed by the architectural firm of Gesellius, Lindgren, and Saarinen. It was published in Dekorative Kunst 3 (1900): 457-63 and in L'Architecture á l'Exposition Universelle de 1900, p. 65, Pl. X. Paris: Libraries-Imprimeries Réunies, 1900. Unless indicated otherwise, the text in this article is either based on Wikipedia article "Exposition Universelle (1900)" or another language Wikipedia page thereof used under the terms of the GNU Free Documentation License; or on original research by Jahsonic and friends. See Art and Popular Culture's copyright notice. This page was last modified 10:40, 21 November 2008.